Rain again, but this was the worst. We brought five Corvettes and one Camaro for this race, but we spent a lot more time watching the weather than we spent on the track. It was dry for the Thursday test and tune day. After the first practice session on Friday, everything else was rained out until our race on Sunday morning. Before that Friday morning practice session the Chief Steward warned us all that this could be the only dry session until Sunday, and that we might want to run it as if it were qualifying. He was right. There were 59 cars in the Group 5 field. For the Friday morning practice/qualifying session the Grand Sport went out on our Road Atlanta/Thursday test day tires and qualified second. Larry Ligas in his wicked fast Jag was on the pole. 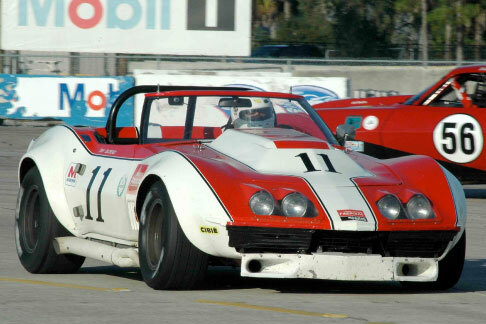 Edward was driving a customer owned 67 Corvette which threw a rod on the first lap. All our other customer cars qualified well. After the session while the rain pounded central Florida, I heard Larry Ligas had run that first session on sticker tires. That’s a big deal because we went out on very old tires, but would have stickers for the race. Our confidence went up a notch. Saturday was more of the same; it rained all day. Our intrepid rookie Clair Schwendeman decided to run the American Challenge race in the rain and the super wet track. 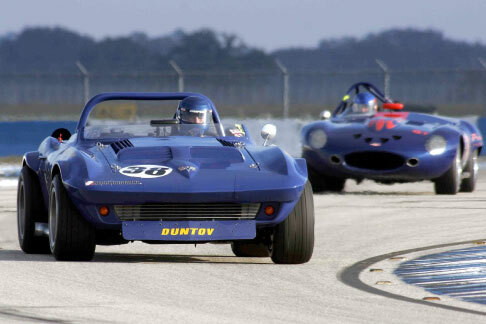 Unfortunately, this was not such a good idea, as he spun on the slick new Sebring logo that had just been painted in the middle of the front straightaway. The car did an agonizingly slow rotation and nosed into the inside wall just past the starter stand at the start of the race. The next event was the night enduro. The only car we brought with headlights was Mark Innocenzi’s Owens Corning Fiberglas 69 Corvette. Mark has painstakingly kept this car as close to its original pedigree as possible. He has actually kept the same headers on the car for over 20 years! One lap into the race the number 5 pipe broke off and disappeared into the night! So, along with the major nose repair on the Clair’s 68, our guys had to fabricate a new pipe and weld it on the OCF Corvette. Fortunately, Napa was still open in downtown Sebring and had just enough bent tubing to make a new header. We cut, fit and welded it together right there in the pits. We worked until about midnight on both cars and made the green flag Sunday morning with 5 out of the 6 cars ready to run. Clair and our Crew Chief John Farnsworth put the final touches on the new front end. Note the color coordinated tape job. 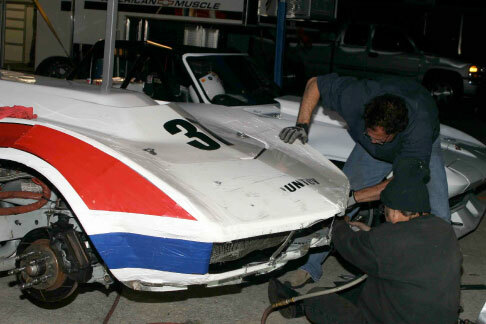 Beneath the tape are dozens of hand formed and riveted aluminum plates that secured and made whole the one piece fiberglass nose of the #37 Corvette. Sunday dawned clear and cold. Our race was scheduled for 8 AM, when the sun was barely above the horizon. You wonder why HSR would schedule the biggest race of the weekend at such an unfavorable hour. The few spectators that were left after two days of solid rain could hardly be blamed for waiting at least until the sun came up before venturing back out to the track. Larry chose the inside, so the Grand Sport started on the outside of the front row. We led the first six laps with one fender to fender skirmish with Larry. The two of us started lapping cars by about the fourth lap, and on the fifth lap we came up on two Porsches that were motoring in the middle of the road just past the hairpin at what seemed to be about highway speed. I checked up, but Larry wisely blew by all three of us on the left. We had a lap and a half to go, and I was sure I would get him back. I was on Larry’s bumper by turn 12 of that lap, but there was a waving yellow at that corner station for a stalled car. 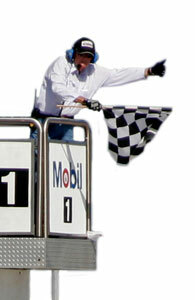 The next flag station was the start finish line, and there they were waving double yellows along with the white flag. The next time by it was the double yellow and the checker. Our fastest lap was almost a second faster than Larry’s, but the rest of them were only fast enough to maintain the lead, and that didn’t allow for any screw ups like lapping two side by side Porsches who were on a Sunday morning drive taking up the whole racetrack! Another lesson learned. Clair finished second among our gang of six. Not bad for his second race ever! Larry deserved the win. The Grand Sport was close to perfect, but the driver wasn’t!! 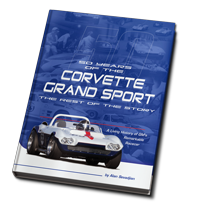 This is the in car video of the Grand Sport’s fastest lap, a 2:18.3. If I had run them all at that pace I would have won the race.